Just like potluck supper and covered dish parties where each person brings a piece of the meal, your leftover sock yarns will come together to create a delicious feast! 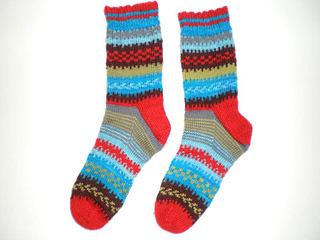 Combine light colors, dark colors, selfstriping, hand-dyed yarns or whatever you have to make your own artistic and unique socks. This sock is worked from the ribbed cuff down to the toe. Heel construction is the traditional flap & gusset method. Patterning is both charted and given in line-by-line written instructions. You choose whichever method you prefer.